Our exclusive high torque continuous sweep movement is even better than before. 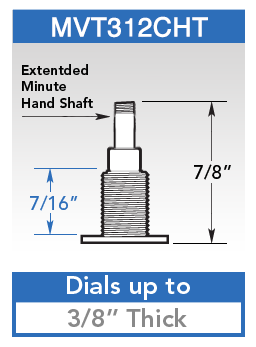 We now offer 10" balanced second hands to make it even more versatile. This bold tapered style can be seen from long distances, which is why it is popular with swimming pace clocks. These new red or black balanced second hands are 10" long from the mounting post to the tip, and can be used with any of our high torque hands, except the models 17" or over. The MVT312CHT continues to be an ISI market exclusive because of its quiet continuous second hand motion. This same continuous second hand motion also causes the minute hand to operate more smoothly and eliminates the slight "wiggle" that can be seen on very large minute hands. This CE and RoHs compliant MVT312CHT is quite simply the best movement of its type that you can buy!